My little sis has turned into quite the little cook since being married. She was telling me about her husband’s family recipe for Ranch Carrots and how it has quickly become a go-to side dish recipe for her. She kept going on and on about how amazing they were and I knew I needed to sample them for myself. Last week she finally brought some over for me to try and I couldn’t get over how delicious they were. Then she proceeded to tell me that they were only 4 INGREDIENTS! Can you believe it?! If you are looking for a simple but tasty side dish to your next meal, definitely give these a try! You family will LOVE them! 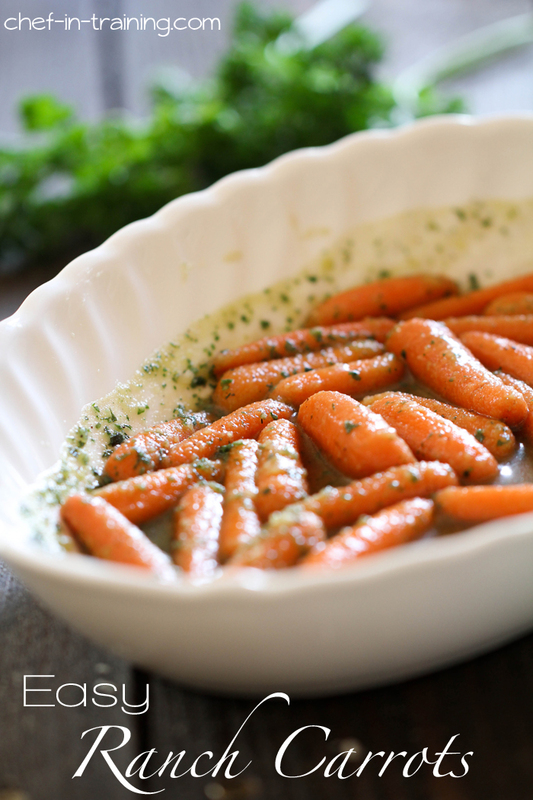 These carrots are SO simple to make and are absolutely delicious! Steam carrots until soft and tender. In a large bowl, combine carrots with butter, brown sugar and Hidden Valley Dip Mix until evenly mixed and combined. Carrots and ranch area match made in heaven, so this have to be amazing! Perfect summer side or really anytime of the year! Carrots cooked this way are so good! Never thought to add ranch!! Wow, you weren't kidding when you said they were easy!! Always like a switch up from plain carrots! These look like a great recipe, that my little one would eat. I'm ALWAYS looking for quick, tasty veggie recipes for my family. One question on the instructions- so you steam the carrots on their own...and then melt the butter, mix it with the dry ingredients and just add the carrots? (or did you mix in the sugar and seasonings into the butter before melting it, so the whole mixture cooks together?) I am just wondering when the sugar melts, etc. These really do sound super yummy! Great idea. I never thought to mix the Ranch with b sugar. Great combo. I'll give this a try. Thanks for sharing. These sound delicious. Can't wait to try them!! Hi ya! Making these tonight and I was wondering - did you melt the butter or just soften it? Thanks so much! I'm gonna melt it now, no time to wait for it to soften. 4 ingredient carrot dish?! Yes please! I could do this! Healthy and YUMMY! Try to be just a little bit realistic here. I am fairly confident if she's making it her family, she's not eating the entire side all by herself in one sitting. When ever we make baby carrots, I always make them with brown sugar and butter BUT I'm throwing in a package of Ranch seasoning next time! yumm! Any suggestions if you don't have a steamer? Can you boil the carrots? Or perhaps use a slow cooker somehow? Thanks! These carrots are simply delicious! You can boil them. Who would have thought to add the ranch! Has anyone used anything in place of the butter? Olive oil? Brummel and Brown? I'm trying to eat more heart healthy. I'm curious about trying it with something other than butter too. I suppose you can experiement. Ive looked it up and Olive Oil is a great substitute for Butter!! I am using it when making these tonight for the first time! I just made these and they are amazing. Will try to add green beans and make it for Thanksgiving dinner. I made these for Thanksgiving, and everyone loved them! I just boiled the carrots, and put everything else in a bowl, then once the boiled carrots hit the butter it melts no problem! These were really good! I cut 1 & 1/4 pounds of regular carrots into coins and had enough glaze left over for another pound or so. We had no carrots left after dinner, but I saved the glaze to use tomorrow on some more! Hi. You can order them on line. I have a few things i can't get i have to order. No problem. Yum! I always love a delicious and easy veggie side to serve with dinner! As was previously stated, this is a recipe for several people not just one so please stop banging on the sugar drum. After you've mentioned salt and msg 3-4 times don't you think that's enough? You've done your job to inform us how we are all eating in a way that is different than what you would choose. Please let it rest and stop hijacking the comment area for this recipe. Butter is fine in moderation. Salt is fine in moderation. Margarine as a poor choice in fat has been pretty much known in the US for quite a while now. I'm glad that I have another side dish to add to my arsenal - easy and tasty. For those of you who don't know, Sam's carries Ranch Dressing mix in containers instead of a single serving packet so it's more economical. Thanks for a nice recipe. Agree with you, Shellie... everything in moderation! I'm excited to try this recipe. My son hates veggies, so I'm trying everything I can to get him to eat them. This may just be the ticket to getting him to eat his carrots! Thanks for saying this! Geez! Can't we just make a carrot dish without the food police chiming in? I am going to make this dish as soon as I get a pkg. of Hidden Ranch dressing and we will enjoy the carrots, I'm certain!